Do you know what style clothes suit you when you hit the shops? The clothes in your wardrobe will look good on you if you know your body shape and shop to suit you. There is something out there for everyone with such variety available in stores, every shape is catered for no matter what proportion your body shape is for daywear, smart casual or occasion wear. You can make your clothes look good on you by working with the right styles to suit your body. Bring out your best features in an outfit and use less emphasis on the not so perfect features! Knowing what clothes work for your shape will help you accentuate the correct areas choose the colours and designs that suit you and your personality. Looking good does not depend on size, any dress size lady can look fabulous and elegant if dressed in the correct style and shaped clothes to suit her body. Don't be a slave to fashion trends, its more important to shop for something that you feel comfortable wearing and therefore you will feel far more confident in yourself. Each one of us is unique and our bodies are too. That said, there are five commonly used shapes, you may fall into one or be a blend of two. The best way to find your shape is to stand in front of a mirror and be honest!! APPLE: Apple shaped ladies have broader shoulders and bust area with narrower hips. Fullness around the tummy and have good legs. WHAT TO DO: You need clean lines and slightly fitted clothes with detail above the bust or below the hips, you want to elongate the top half of your body with v necklines. AVOID: Short sleeves that end at your bust line, fuss or detail around the bust or hips. Jeans Tip: Wide leg or bootcut with no fuss or detail on them. STRAIGHT/LEAN COLUMN: Straight shaped ladies are same size top and bottom with little definition of the waist, narrow shoulders and small bust. WHAT TO DO: Create the idea of curves around the bust and hip areas with layering or use of pockets or other detail on your clothes. AVOID: Avoid long straight lines and figure hugging outfits. Jeans Tip: Bootcut but avoid wide leg. 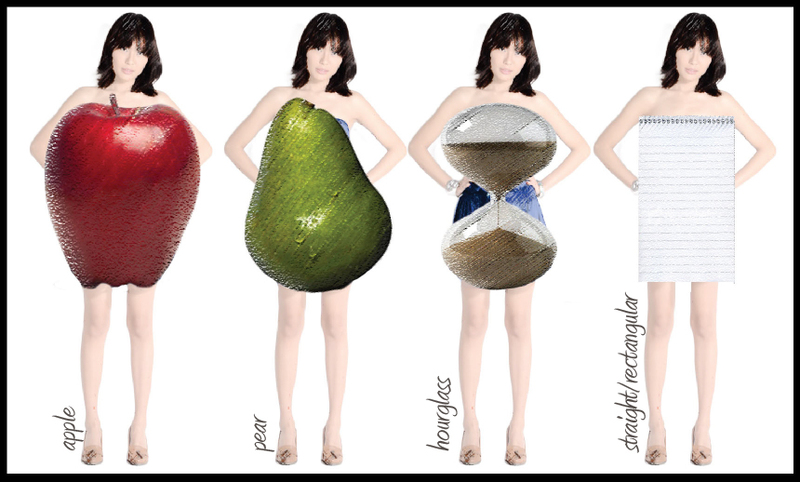 PEAR OR SPOON: Pear shaped ladies have broader hips with narrower shoulders/bust. WHAT TO DO: Balance your top half with the bottom. Make shoulders look wider with shoulder pads or caped sleeves. AVOID: Narrow leg or pinstripe. Fuss or pockets on your thigh area. Jeans Tip: Bootcut in darker tones. SLIM HOUR GLASS: Ladies have the similar size bust and hips with clearly defined waist. WHAT TO DO: Enhance your body shape, hips, bust and waist. AVOID: Clothing that hides your body shape. FULLER HOUR GLASS: Ladies have the similar size bust and hips with clearly defined waist. WHAT TO DO: Wide low necklines, sleeves past the elbow. AVOID: High necklines. Straight shapes that hide your waist. Jeans Tip: Classic bootcut or straight leg. Focusing on your negative areas that you want to hide for example hips or tummy means you are not taking in the overall look. You need to work with your complete shape and this guides you towards certain style clothes that will enhance your complete profile. Think about your shape when you next hit the shops!!! Hope you picked up a few tips from my blog, thank you for reading.